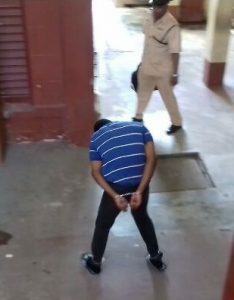 A former University of Guyana student, who has been previously charged in connection with several serious crimes, was Tuesday arraigned on a charge of attempted murder. Guyanese police arrested Kurt Kendall on October 6, 2017 immediately on his arrival from the United States where he had been charged with cocaine trafficking. Chief Magistrate, Ann Mc Lennan read the charge stating that on February 3, 2017, being armed with a gun at Mandela Avenue, Georgetown, he discharged a loaded firearm on Christopher Marks with intent to murder him. He was not required to plea to the indictable offence. Kendall was remanded and will return to court on October 17. The attempted murder accused had swallowed 200 pellets containing approximately one kilogramme of the narcotic. He had been arrested by US law enforcement agents at the John F. Kennedy International Airport on April 9, 2017 immediately after deplaning a Caribbean Airlines flight from Guyana.